How do owners react when REOs devastate the comps? How about listing their houses at WTF asking prices and hoping for the best. They really should be ashamed of themselves. Today’s property is one of two recent listings on the same street as last week’s distressed property. The only difference is a doubling of the asking price. WTF? We are scheduled to have an IHB Block Party on Monday, March 9, 2009, at J.T. Schmids at the District. Come out and meet with everyone from the IHB. Sellers in Turtle Ridge obviously have no shame. They should. Some of their asking prices are embarrasing. We are in the depths of a global economic recession rivaling the Great Depression, asset prices of all kind are dropping, the stock market is trading at 1996 levels, unemployment is rising, and yet, despite all these problems, houses in Turtle Ridge have continued to appreciate. Last week I profiled 46 Crimson Rose, Irvine, CA 92603 asking $1,215,000. This is a house on the same street as the two we have today. The house at 46 Crimson Rose can’t sell at $1.2 million, so surely asking over $2,000,000 isn’t going to work. Well, the neighbors think asking $2M+ will work just fine. The vacant property at 48 Crimson Rose, Irvine, CA 92603 is asking $2,295,000. Are you kidding? Perhaps these listings were on the market for a while and the distressed listing just came on the market and is making them look bad. Nope. The distressed property has been on the market over 60 days, and these two new listings just came on the market this week. Both of these homeowners, both of whom are supporting empty houses, just listed these properties for a million dollars more than their neighbor. I cannot even imagine the thought process these people must have gone through. The both must know their neighbor has been for sale for over 60 days at $1.2 million. Perhaps they just pretend the short sale isn’t there. They must reason it isn’t part of the “real” market. And surely their houses are much superior to that other one. I can’t get my mind around it. For that reason, it is a WTF award winner. Oh, the upgrades must make it worth so much. I get it now… not. Located in prestigious Summit @ Turtle Ridge. I think he means the pretentious Summit at Turtle Ridge. This property has all the signs of a pure speculative flip. The owner set up a corporation to buy the property. There is a $1,575,000 first mortgage, and the rest was a downpayment. The corporation would get to write off the interest over $1,000,000 whereas an individual cannot. Plus, there may be some additional liability and credit protections if the owner did not have to personally guarantee the loan. In any case, the property does not appear to be lived in, so this flipper has been bleeding cash since he bought it in early 2006. Perhaps he lived in it for a while and has since moved. I don’t know. If this property sells for its asking price, the owner will make money on his flip. Of course, for that to happen, someone with more money than brains is going to have to put down a lot of cash to buy this place, and this property will have to have appreciated in value while every other property in the United States has not. This seller isn’t the really greedy one. The owner of 48 Crimson Rose, Irvine, CA 92603 is asking $2,295,000. He thinks he is going to make $500,000. WTF are these people thinking? This entry was posted in Mortgage Fraud on March 5, 2009 by IrvineRenter. People have different ideas on what a median property looks like in Irvine. Based on its sales history, today’s featured property certainly qualifies. Contrary to popular belief among the bulls, a median income household is supposed to be able to afford a median priced house. I have written at length about Affordability in the post of the same name. When prices are very high relative to incomes, affordability is very low. Usually this is associated with people using affordability products (toxic financing). Very low affordability creates bizarre alternatives for those who do not wish to play the toxic financing game. For instance, today’s featured property is an old, smallish 3/2 in an average neighborhood. It sold for $740,000 in 2005. At that price, this property is only affordable to a household making $185,000 putting $148,000 down. Look at the house. Does it look like the property you would expect someone who is making that kind of money to live in? A household making $185,000 a year is in the top 20% of wage earners. Since rents are directly tied to incomes, these wage earners could still rent a property in the top 20% of Irvine’s properties. Therefore, the alternative facing those looking for housing at the peak was to chose between renting the property the is commensurate with their income, or buying a property that was several rungs down the property ladder. With the conditions of the bubble rally–greed for rapid appreciation, fear of being priced out, the belief that prices cannot fall, no-limit financing alternatives, and an unbridled sense of entitlement–it is not surprising that few people stayed within conservative financing guidelines. When you think about it, the bigger surprise is that anyone did behave conservatively. 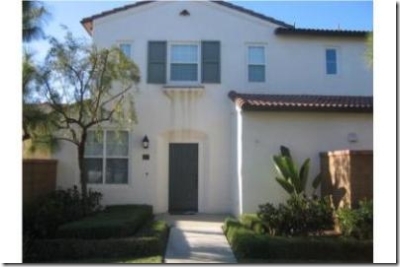 Today’s featured property is a great example of a median property in Irvine. Half of Irvine’s properties are nicer, and half are not as nice. The strongest evidence for this comes from the sales history. I used the DataQuick numbers for Irvine (current value is a guess), and as you can see, the difference between the actual sales price of this property and the Irvine Median is very small over a large number of transactions. Continuing the theme of matching the median, I believe this property will fall down to the the low $400s somewhere below the 2003 purchase price, perhaps lower if there is overshoot. The last sale, the one to the current owner looks fishy to me. The flipper before them did not get a bargain. There was no huge discount based on comparable pricing. Despite this fact, this flipper was able to find someone willing to pay $80,000 more for this property 3 months later. This purchase prices is clearly too high. Why would someone do this? Ignorance is one answer (or defense), but in a fraud scheme, the buyer would be in on the deal, and they would be getting a piece of the $80,000 profit. This house was purchased on 7/5/2005 for $740,000. The owners used a $592,000 Option ARM and a $148,000 downpayment. On 5/19/2006 they opened a HELOC for $134,000 taking out most of their equity (or at least gaining access to it). Assuming they took out their downpayment, the total debt on the property is $726,000 plus three and one-half years of accumulated negative amortization. Does anyone want to bet that this owner hit their 110% cap causing a mandatory recast? If so, the property debt is closer to $775,000. In any event, a $580,000 asking price is going to be a short sale, and the lender is going to lose money. I don’t know how much, but it could easily be $250,000 or more. This is one of many Option ARM implosions we are going to see. There is no hope for these people because their payment after the recast is going to be astronomical. If they could afford it, they probably would not have taken out the option ARM to begin with. However, even if we give them the benefit of the doubt and assume they could afford the payment, why would they bother. Who is going to pay 2 or 3 times the going rental rate for a property that is $250,000 underwater? Nobody is. 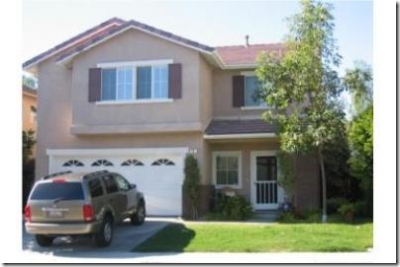 This entry was posted in Mortgage Fraud, Short Sale on February 17, 2009 by IrvineRenter. Commodities are items of value and uniform quality produced in large quantities and sold in an open market. Although every residential real estate property is unique, these properties became uniformly desired by investors because all real estate prices rose during the Great Housing Bubble. The commoditization of real estate and the active, open-market trading it inspires caused houses to lose their identity as places to live and call home. Houses became tradable stucco boxes similar to baseball playing cards where buying and selling had nothing to do with possession and use and everything to do with making money in the transaction. In a commodities or securities market, rallies unsupported by valuation measures will fall back to fundamental values. It is very clear the rally in house prices was not caused by a rally in the fundamental valuation measures of rent or income. Many people forgot the primary purpose of a house is to provide shelter — something which can be obtained without ownership by renting. Ownership ceased to be about providing shelter and instead became a way to access one of the world’s largest and most highly leveraged commodity markets: residential real estate. Commodities markets are notoriously volatile. In fact, this volatility is the primary draw of commodities trading. If market prices did not move significantly, traders would not be interested in the market, and liquidity would not be present. Without this liquidity, hedgers could not sell futures contracts and transfer their risk to other parties, and the whole market would cease to function. Commodities markets exist to transfer risk from a party that does not want it to a party who is willing to assume this risk for the potential to profit from it. The commodities exchange controls the volatility of the market through the regulation of leverage. It is the exchange that sets the amount of a particular commodity that is controlled by a futures contract. They can raise or lower the amount of leverage to create a degree of volatility attractive to traders. If they create too much leverage, trader’s accounts can be wiped out by small market price movements. If they create too little leverage, traders lose interest. The same principles of leverage that govern commodities markets also work to influence the behavior of speculators in residential real estate markets. If leverage is very low (large downpayments or low CLTV limits,) then speculators have to use large amounts of their own money to capture what become relatively small price movements. If leverage is very high (small downpayments or high CLTV limits,) then speculators do not have to put up much money to capture what become relatively large price movements. The more leverage (debt) that can be applied to residential real estate, the greater the degree of speculative activity that market will see. Also, the smaller the amount of money required to speculate in a given market, the more people will be able to do so because more people will have the funds necessary to participate. When lenders began to offer 100% financing, it was an open invitation to rampant speculation. This makes the return on investment infinite because no investment is required by the speculator, and it eliminates all barriers to entry to the speculative market. In a regulated commodities market, the trader is responsible for all losses in their account. In a mortgage market dominated by non-recourse purchase money mortgages, lenders end up assuming liability for losses in the speculative residential real estate market. This is a fantastic deal for speculators; for the lenders… not so much. Today’s featured property is a classic example of speculation in the residential real estate market. When this seller was a buyer, they utilized 100% financing right at the peak of the bubble. Now that resale values have gone south, the speculator is letting the property go into foreclosure, and the lender is going to be left holding the bag. Terrific Location in Irvine–conveniently close to parks, schools, shopping, dining and entertainment. Beautiful landscape/hardscape done by professionals in the backyard. Hardwood floors throughout first floor. If the lender gets the asking price on this one, they stand to lose $192,500 after a 6% commission. This also assumes the borower is current on the mortgage and there is not a large amount of deferred payments adding to the balance due. All part of the price these lenders paid for enabling people to trade houses as commodities and assuming the risk of loss. This entry was posted in Mortgage Fraud, Price Rollback, Real Estate Analysis on March 11, 2008 by IrvineRenter. This short sale price will probably not be approved by the lender as it is too far outside of their loss limitation guidelines. It is probably priced this low to entice bids in order to give the bank an idea of where the market will be after they take the property back in foreclosure. The bank will lose money, but they will follow their guidelines for loss mitigation which will not permit a 30% haircut after a little over 7 months. It appears to me the buyer on 10/12/2006 was a straw buyer bailing out the 10/27/2005 buyer. The $515,000 sales price, after a 6% commission, would net this seller $20,000 — enough for a payment to a straw buyer and/or the person who arranged the sale. This is pure speculation on my part, and the previous seller may simply have gotten lucky, but when you see a short sale after 7 months, it is probably a first-payment default fraud. This may be a flip gone flop, or it may be fraud, either way this never should have transacted at a price over $500,000, and its next transaction (after the bank buys it at a foreclosure auction) will likely be less than the 2005 price. The sellers who will really be displeased by this whole mess are the neighbors. The above sale won’t feed their fantasy price, but then again, they probably will ignore its significance as an aberration, drink some kool aid, and deepen their denial. This entry was posted in House Flips, Mortgage Fraud on June 12, 2007 by IrvineRenter. Back in October, we did a post on a property in North Park and discovered some fraud going on. Even Casey Serin stopped by and posted a comment. Recently, I’ve gotten some excellent leads on even more fraud going on in Irvine and beyond. I’d like to thank graphrix, brealiving, and IrvineMom for all their help in uncovering this. This thread in our forums was extremely helpful. Figuring out how all the fraud is connected is a lot of work. Writing a post to explain it is even more difficult. So please accept my apologies if this is hard to follow. Also, because I’m convinced there is something shady going on here, I’m not going to go through the extra work of jumbling names, etc. It’s all public information anyways. You can see how the property at 1 Thorn ties all 4 of these people together (it looks like they are 2 couples). Also, ALL 7 of these properties were purchased on 100% financing. The 6 properies that are on the market are listed by Darlene Gallegos of Century 21 Beachside (just click on the links and you’ll see this). Of the 6 that are listed, 5 of them say they are short sales in the private remarks. So how is Group 1 linked to Group 2? There are a few connections although I’ll be the first to admit they are kind of loose. First, the Sabina Yeasmin in Group 2 could be related to the Marina Yeasmin in Group 1. Second, 81 Sorenson in Group 2 is practically next door to 78 Sorenson and 86 Sorenson in Group 1. Third, the agent listing the properties in Group 2 is also listing the properties in Group 1. What do you think? David Schumacher is the common element here in Group 2. Anyone know what a revocable intervivos trust or a Warranty Grant Deed is? All 4 of these homes were purchased using 100% financing. Also, I don’t have any info on Hoque’s properties. Does anyone know if there is a NOD on them? If not, they could be legitimate. Here, the common link is First Capital Investments Inc. All 4 of these properties are listed on Foreclosure.com. They were all transferred to First Capital Investments on 11/28/2006. They were all initially purchased with 100% financing. Some of you may have noticed that the last propety, 39 Modesto, is the one that started the original fraud post back in October (yup, Shagi Indud = Giash Uddin). Apparently, all of Giash’s properties were transferred to First Capital Investments as well. Thanks to someone who may want to remain anonymous, I’ve come to find that there are 16 properties (7 from Giash, 3 from Group 3, and 6 others) that are owned by First Capital! And almost all of them are NOD! Ok, we’ve got 11 homes in Groups 1 and 2 that could be connected. And we’ve got possibly 16 homes in Group 3. But is there a link between Group 3 and Group 1? Well, after a little bit of digging, I found out that the address for First Capital Investments AND Crossroads Enterprises is the SAME on the property records! Crossroads Enterprise is the entity that is on the title of 63 Modesto in Group 1. The address for both of these companies is: 25202 CRENSHAW BLVD STE 301, TORRANCE CA 90505. That’s possibly 27 properties that may be intertwined in some sort of fraud! Now what? Time to dig up what we can on these corporations. I’ve got some leads from a source who may want to remain anonymous. Apparently, First Capital Investments may be incorporated in Nevada. If anyone has information on these companies, please email me (zovall at gmail dot com) or post a comment. I’ll try to do a follow up post but it may take a while. This entry was posted in Mortgage Fraud on March 19, 2007 by zovall.